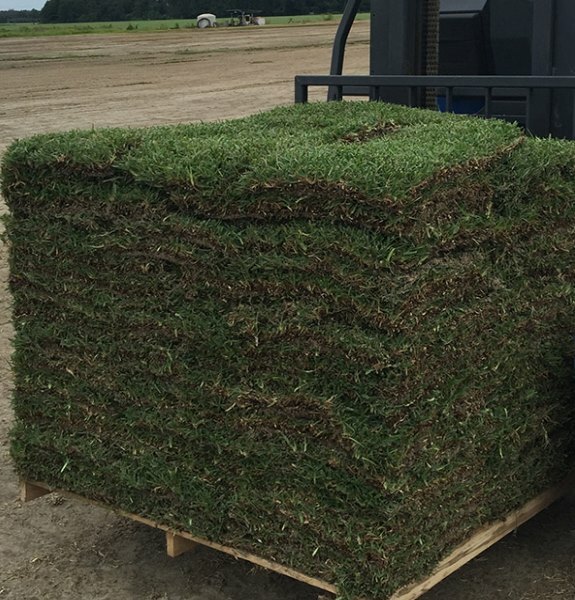 Floratam grass is a vigorous, coarse textured St. Augustine grass variety. Developed by agricultural stations in 1972 to be the most drought tolerant of all St. Augustine grasses. Floratam has very good fall color retention and greens up nicely in the spring. The blade width can reach between 5mm to 7mm on average and has a nice blue-green color tone. St. Augustine Floratam can grow in Sandy, Loam, Clay and even muck. It has an excellent wear and injury recovery rate. Floratam performs best in full sun and can tolerate shade. When established St. Augustine Floratam is a super think turf grass it tends to drown out most weeds that try to establish. Overall St. Augustine Floratam is a very versatile turf grass that is commonly used for residential lawns, commercial lawns, golf courses, and sports fields. Our St. Augustine Floratam comes in 500 sq. ft. pallets. We have developed a stringent fungus, mildew and foreign vegetation maintenance program to ensure quality, healthy sod arrives at your home. We have a 30 day weed warranty on all of our grasses. Our St. Augustine Floratam comes in 500 sq. ft. pallets.